Sales representatives and project managers of plastic injection, casting and mold / die companies are all too familiar with the request from customers inquiring about the effort and costs involved in producing a specific part. The part must be inspected and analyzed to draw these conclusions before supplying an answer. What is the best tool for this purpose? An important function that supports this process is a wall thickness analysis tool. With 3DViewStation, KISTERS provides an easy-to-use, affordable CAD visualization application that assists all users involved in this process. Typical functionalities needed to support such processes are the loading of native CAD files, volume calculations, measurements, dimensions, sections, annotations and the ability to isolate and inspect parts. Results of this work can be organized into views and easily saved for later retrieval. 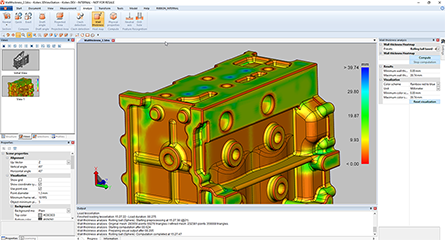 “Users think advanced analysis functions are only available in CAD systems. However, 3DViewStation provides these functions at a much lower price point,” said Kelly Baumann, KISTERS North America Business Development Manager.